Yves Moreau lives in Montreal, Quebec, Canada and is recognized as one of North America's foremost exponents of Bulgarian dance and folklore. He has travelled to Bulgaria almost annually between 1966 and 1986 to research dance and to record music in all regions of the country. He has also lectured and conducted workshops throughout North America as well as on numerous occasions in Belgium, France, the United Kingdom, Italy, Switzerland, Germany, Austria, the Netherlands, Sweden, Norway, Mexico, Brazil, Israel, Japan, Slovenia, Hungary, Taiwan, Hong Kong, Thailand, Singapore, New Zealand, and Australia. From 1972 to 1988 he directed Les Gens de Mon Pays , a Montreal-based amateur folk ensemble specializing in Bulgarian and French-Canadian folklore which toured widely in North America and represented Canada at several international folk festivals in the U.S.A. , France, Greece, Italy, and Bulgaria. 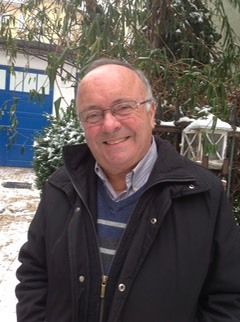 Yves has also choreographed several stage suites of Bulgarian and French-Canadian material for various professional and amateur performing groups in North America, Australia and New Zealand. From 1975 to 1985, Yves was special projects coordinator at the Canadian Folk Arts Council and also worked with Folklore Canada International , a private organization which coordinates cultural exchange programs and produces several international folk festivals in Canada. From 1986 to 2000, he was the coordinator of FCI's annual Heritage International folklore workshop in Lachine (Quebec) and Cornwall (Ontario). Yves who speaks Bulgarian has been a regular contributor to various folk music and folklore programs for Canadian radio and television. He has supervised recordings of Bulgarian folk music on the Balkanton , Worldtone , XOPO, Gega and BMA labels and has presented several papers at various conferences on ethnomusicology and folklore in America, Asia and Bulgaria. In 1980, Bulgaria awarded him with the Order of Kiril & Metodi (1st degree) for his work popularizing Bulgarian folk culture in North America. Yves teaches mostly non-choreographed village material which he has collected during his many field trips. His teaching method is clear and thorough yet relaxed. A special emphasis is put on regional styles and background information. Above all, Yves wants to share his love for Bulgarian folklore and communicate the fun of dancing. Yves has also introduced and teaches folk dances of other Balkan countries as well as dances from Brittany (France) and his native Québec. Among the popular dances introduced by Yves over the years are: Pinosavka, Dobrudžanska Râka, Gjuševska Račenica, Četvorno Horo, Dospatsko, Bičak, Sandansko Horo, Sadi Moma, Vlaško Horo, Sitna Zborenka, Panagjursko Horo, Kulska Šira, Dobra Nevesto, Vidinsko Horo, Sâbrali sa se sâbrali, Idam ne Idam, Dimitrija, Krivo Ihtimansko, La Bastringue, Les Saluts, Le Laridé, An Dro Retourné and Gavotte d'Honneur. Yves has produced five (5) DVDs and matching audio CDs of his repertoire and has also released 3 CDs with some of his Bulgarian Village Recordings (1966-1972) on the BMA label. He also produced in 2003 a 2-CD collection of tunes by the legendary Bulgarian accordionist Boris Karlov (1924-1964) and just released (Sept. 2015) a new CD compilation dedicated to the famous Thracian clarinetist Georgi Koev. Yves is married to France Bourque-Moreau, an internationally-recognized specialist in children's folkdance and music. They have three children. From 1998 to 2001, Yves was on the Board of Directors of the East European Folklife Center (EEFC) which organizes the annual Balkan Music and Dance Camps in the U.S.A. In 2006, Yves was the recipient of the of the San Antonio College (Texas) Folk Dance Festival Award and in 2007, of the «Preserving our Legacy Award» given by the National Folk Organization U.S.A. (NFO) for a Lifetime of Work and Achievement in Folk Dance and Folk Arts. In the summer of 2008, Yves celebrated his 60th birthday and 40 years of teaching Bulgarian Folk Dances and received the Presidential Medal and letter of congratulations from Bulgarian President Georgi Pârvanov. 2017 marks his 50th year of teaching Bulgarian fol dances around the world.